The CitiCar was a 2-passenger, battery powered runabout that cost just $2700. Over 4000 of these cheese wedge-shaped shoeboxes on wheels would be plugged into the nation’s power grid from 1974 to 1982. It is hard to say if the CitiCar represented a bold vision of a utopian future or a half-baked pipe dream based on yesterday’s technology. Either way, the Citi Car is an important but often forgotten footnote in the evolution of the electric car. Immersed in today’s media hype and celebrity culture, one could be forgiven for thinking that Tesla’s Elon Musk invented the electric car. Few people are aware and far less remember that more than 100 years ago, at the turn of the last century, the preferred power source for the automobile’s future had not yet been decided. Steam, gasoline and electricity were battling for the hearts and minds of would be buyers of these new contraptions. Back then electricity actually had the edge. Early gas engines were tedious to maintain. They employed crank starters that were physically challenging and dangerous to use. Steam engines required significant technical skill to get them fired up and rolling, not to mention it was a bit disconcerting to know that you were sitting atop a pressurized boiler. Electrics were a snap to start, easy to operate, required little maintenance and were quiet. Indeed, in the year 1900, electrics outsold both rivals by a decent margin. But electricity had its limitations, too. Even the best, most pricy versions could do no better than 50 miles on a charge. Speed, hills, cold, as well as the battery’s age, each ate into range to the extent that most drivers started getting nervous after 20 miles. By the end of the century’s first decade, the choice was down to two. Steam power had fallen by the wayside. Its operation proved too complicated and cumbersome for a typical driver to master. The death blow would come for electrics came a few years later. Charles Kettering finally developed a workable electric starter for the 1912 Cadillac, thus doing away with those difficult and temperamental hand cranks. Kettering’s self-starter soon became widespread and the internal combustion engine was on its way. Over the ensuing century electricity would occasionally attempt to stage a comeback. The first serious spark came in 1959 when the parent conglomerate of Emerson Radio and the Henney Body Company teamed up to build the 1959 Henney Kilowatt. The Kilowatt was based on the Renault Dauphine, used a 36V motor and could travel 40 miles on a charge. At about half the size of a typical American car, while costing twice as much as much, it is not surprising that only 47 Kilowatts were sold. Most of those were to utility companies for research or promotional duties. Henney Motors was out of business by 1961. It would be another dozen years before the next occurrence of an electric dream. The 1970s was an automotive decade that many enthusiasts prefer to forget. Sensuous styling mixed with pavement melting horsepower had made the 1960s a golden age for the American automobile. Suddenly it was gone, swept away by a quadruple blast of inflation, recession, fuel shortages and regulation. As automakers struggled to adapt their old ways of thinking to a new reality, pessimism ran rampant. Innovation took a back seat to survival. The future of the car as we knew it was in question. Out of the depths of this malaise, Bob Beaumont, a charismatic Chrysler dealer from Upstate New York, decided that the time was ripe for upending the American automobile industry. He sold his dealership and began working with EV conversions. 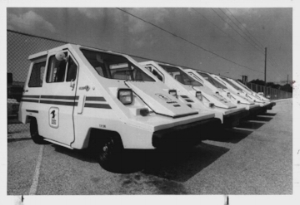 By 1973, Beaumont had founded Sebring-Vanguard Corporation and was producing a tiny electric coupe that was not much more than a 4-wheeled scooter with a roof and a steering wheel. Van and roadster variants followed. Beaumont’s next EV was essentially the last step, the missing link on the golf cart’s evolutionary progression into a car. Priced at just $2,700, the 1974 CitiCar SV36 was designed to be the cheapest most basic vehicle one could make and still meet NTSB standards to be called an automobile. The SV36 was powered by a 3.5hp motor and six 6-volt batteries and claimed a 28mph top speed and 35-mile range. These numbers decreased rapidly if hills and/or cold weather were involved. Beaumont introduced the CitiCar SV48 in 1975. By adding two extra batteries, the car’s range and top speed were extended somewhat. The 1976 CitiCars where actually moderately appealing. Called the Hatchback Coupe, CitiCars now had real doors instead of curtains, a hatch accessing the rear storage shelf and a new 6.5hp motor. Despite these improvements, motor and battery technology was not much more advanced than the RVs from 75 years earlier. A slightly longer CitiCar called the CitiVan was offered in 1977 but it was too late for Sebring Vanguard. They sold over 2200 EVs over 4+ years before eventually over-extended themselves and had to be liquidated to pay off debts. Sebring-Vanguard assets were purchased by a New Jersey company with plans to resume EV production. There was a cloud hanging over some of Beaumont’s promises and business dealings, so the company name was changed to Commuter Vehicles, Inc. The CitiCar was renamed the ComutaCar. Two thousand more Comutacars were made into the 1980s. Some of the last several hundred were sold to the U.S. Postal Service. That relationship ended badly and Commuter Vehicles folded in 1982. By the early 1990s, Bob Beaumont had raised enough funds to get back in the EV business. This time his offering was a bit less austere. The estimated 20-25 Tropica electric sports cars he built in 1994 were Beaumont’s last EVs. With over 4400 cars sold from 1974-1982, the CitiCar in its different variations, would ending up being the 20thCentury’s most popular electric car. Bob Beaumont passed away in the autumn of 2011. That was only a few months before Tesla introduced its mass-produced Model S, and America’s perception of electric vehicles was forever changed.